As Samwise Gamgee once said about potatoes, “Boil ’em, mash ’em, stick ’em in a stew!” There are many ways to cook a potato, and we’re about to show you a new one. Slice whole potatoes almost all the way through, so that the slices are all still attached at the bottom of the potato. Drizzle with olive oil (or truffle oil, YUM), salt, and your favorite seasonings. Bake for about 40 minutes at 425. I started with three potatoes; two large, and one small one for the munchkin. 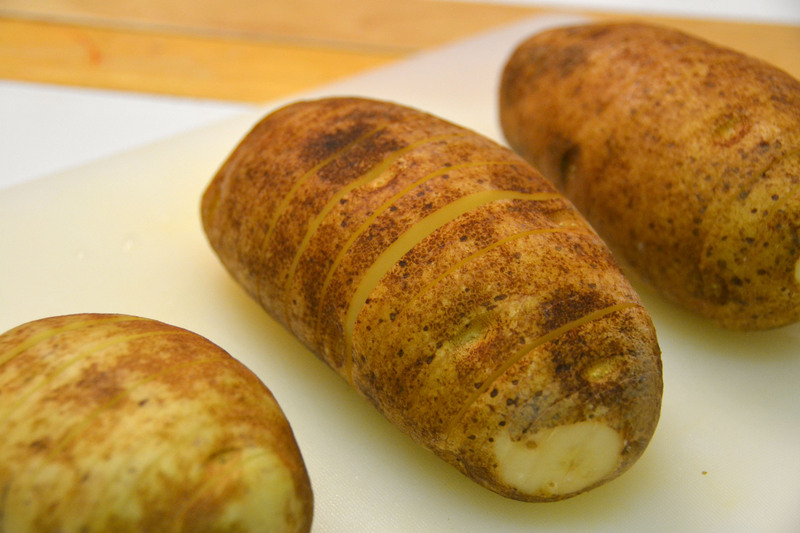 After a good scrub to get the dirt off (because no one likes dirt in their teeth), using a very sharp knife, I sliced the potatoes as instructed. I kept my slices somewhat thick because I didn’t want to accidentally cut a chunk out of the potato. 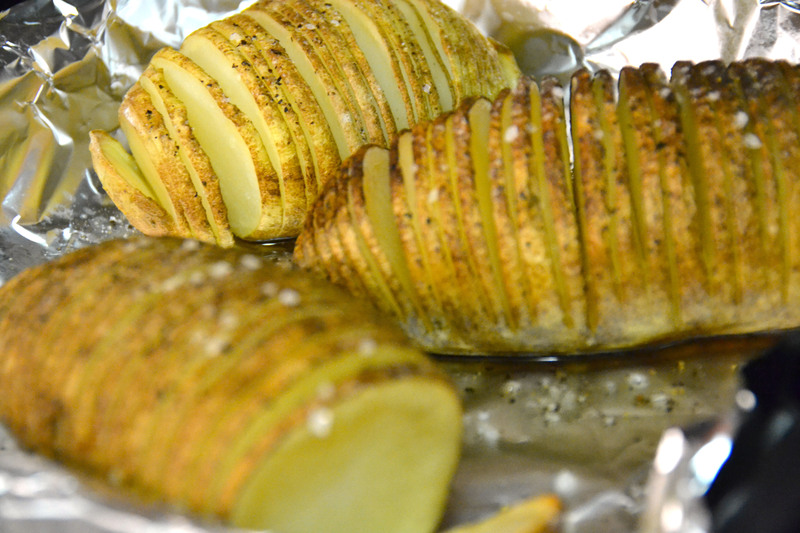 I oiled, salted, and peppered the potatoes, adding a sprinkling of sea salt on top before tossing them in the oven. About half way through the cooking time, I added some pork chops (in a separate pan), into the oven. Oiled, and seasoned, and ready to be baked. Along the way, I think I made a few mistakes. Firstly, I didn’t drizzle the olive oil, salt, and pepper in between the slices. Doing so might have distributed the salt and pepper more evenly, adding more depth of flavor. Secondly, the pork chops. I should have cooked them separately from the potatoes, allowing the potatoes to cook through completely. By adding the pork chops in the oven with the potatoes, I took heat away from the potatoes which did not let them cook all the way through. Finally, I should have added more seasonings. I played it safe with the salt and pepper. Next time I might try rosemary, thyme, or maybe even some Mexican spices to give the potatoes a little kick. All in all, they turned out fine. I would definitely make these again, but with a few changes. What do you think? 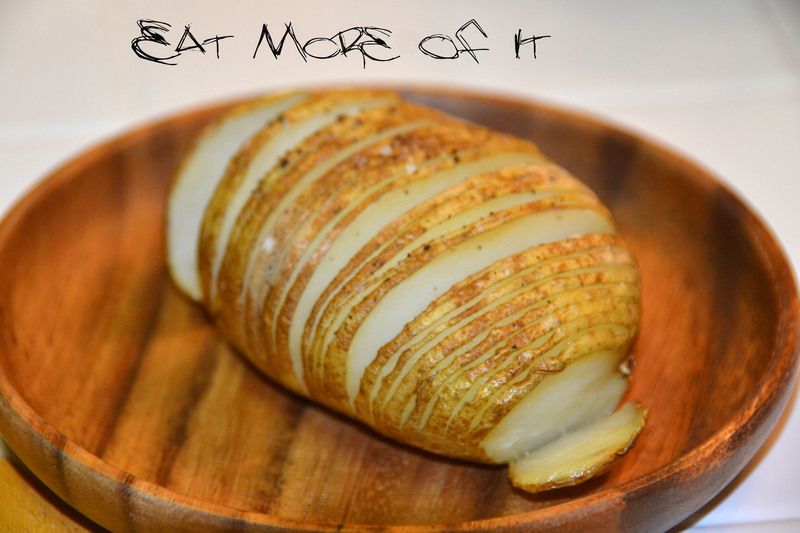 Have you made potatoes like these before? What did you do? What would you try if you were making these potatoes?